TULIP FEVER - Official US Trailer - The Weinstein Company. MOVIE VIDEO. Petition Update. Gun Paranoia Control. Gun Paranoia, Toy Guns Illegal. 30 APR 2016 — During a regular firearms check the attending Police Officer spotted a toy muzzle-loading pistol I had made many years ago for my 3 boys. The officer told me that if a member of the public were to see this toy gun & complain, that I could be charged with firearms offences. I was hoping that my grandchildren could play with these toys, but now it seems that they can not. This paranoia gun control has to stop. PLEASE sign my petition. 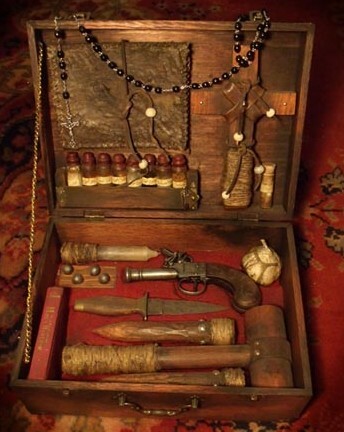 At this present time, working replica (replicas of original 17th and 18th century antique muzzle-loading pistols) muzzle-loading pistols of the lock types matchlock, wheellock, tinderlock, doglock, snaphance, and flintlock can only be owned by a person possessing a category H gun licence, and these pistols can only be legally fired on a registered gun range. This requirement excludes the use of these antique replicas for Living History and Historical Re-enactment purposes. 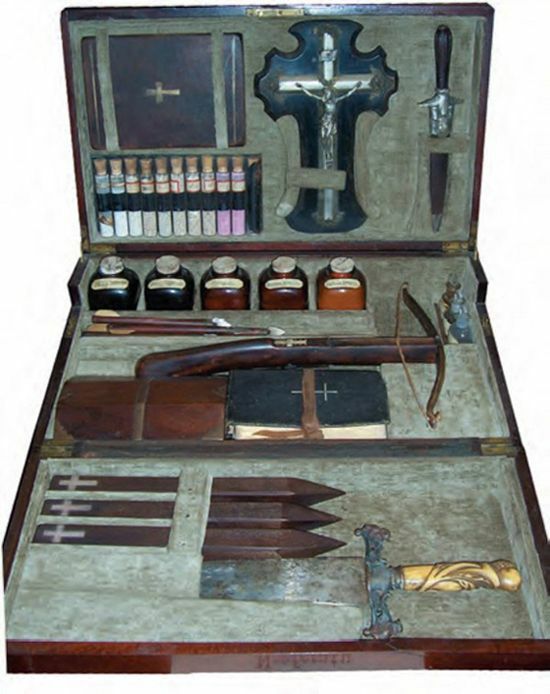 It also excludes the use of these antique replicas for use as a back-up safety for muzzle-loader hunters hunting on private property who are hunting with single shot muzzle-loading rifles or smoothbores. 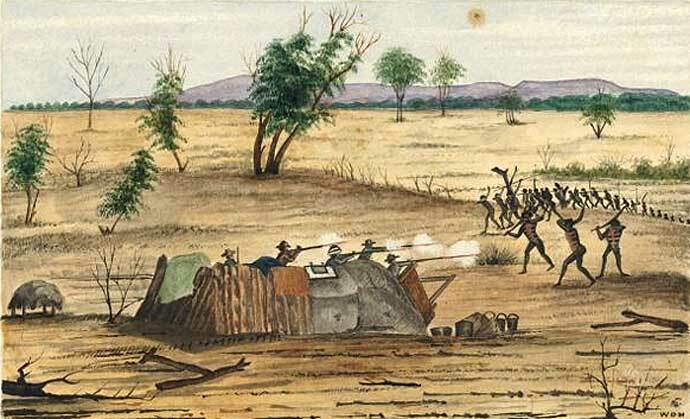 Bulla Queensland 1861 conflict Settlers under attack from Aboriginal tribe. Blades from stone to steel. 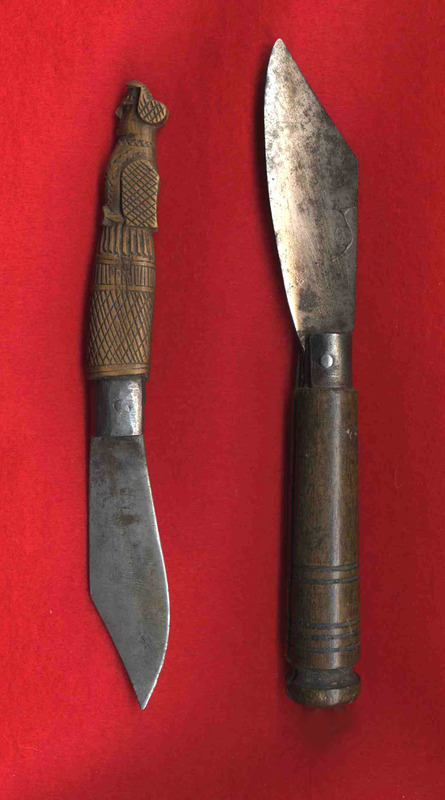 French & Indian War era Penny knives. Many good images at this site. PLEASE NOTE: Patch knives are mentioned in this article, but to date I have found no evidence that patch knives per se existed. 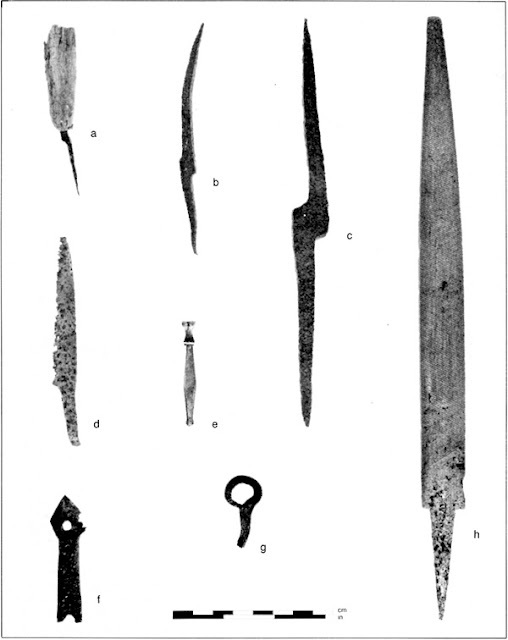 I think it more likely that these knives were utility knives, & some may have been used for cutting patch material. 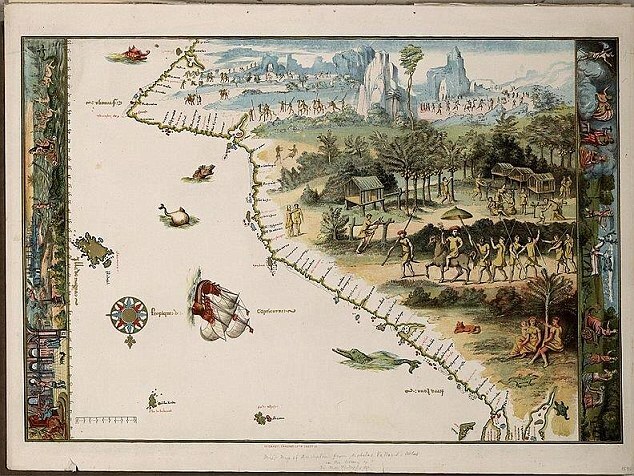 Juet's Journal of Hudsons 1609 Voyage. PDF. 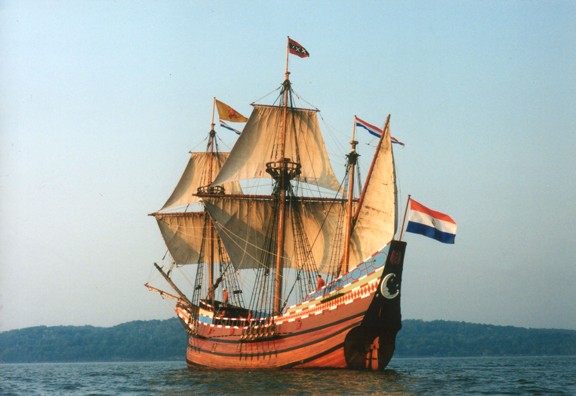 Replica of Henry Hudson's ship the Half Moon, seen sailing up the Hudson River on the 400th anniversary of Hudson's original voyage. 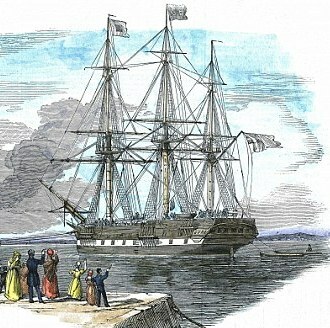 Behaviour deteriorated as the ships crossed into the Tropics and the hatches were taken off at night to let the prisoners breathe some cooler air. 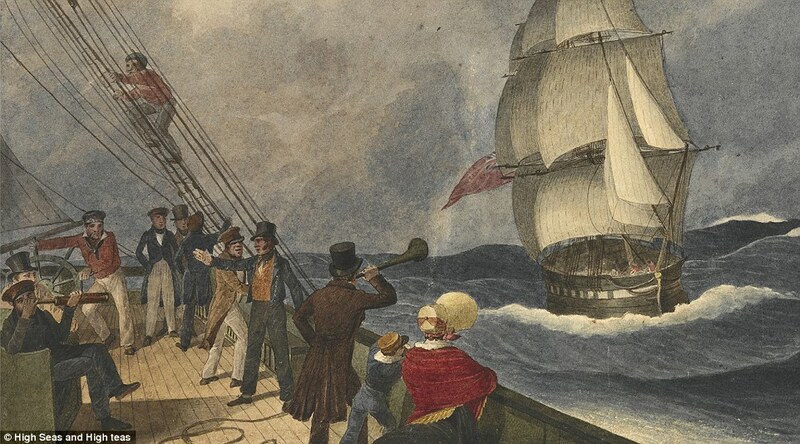 This meant they could escape on deck. 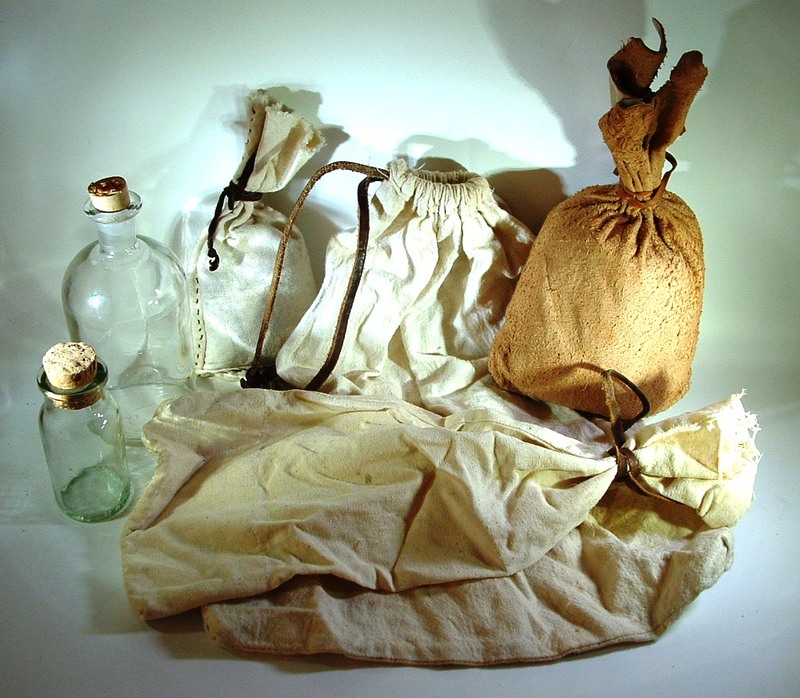 In the 18th century bottles, jars & cloth bags were popular items for containing a variety of foods, spices & drinks. Bottles in particular have been found at many historical sites, & it is known that they were reused for containing a variety of liquids. 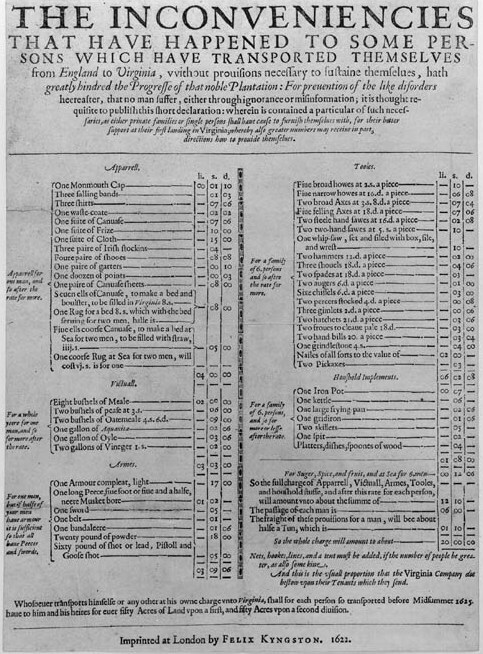 It seems that commercial sales of foods stuffs was in bulk form, suggesting that the retail purchaser would supply their own containers for the amount they wished to purchase, but also money was offered by some businesses for bottles, suggesting that some retailers offered these bottles to customers. Some of the author's items for repackaging food & drink products. 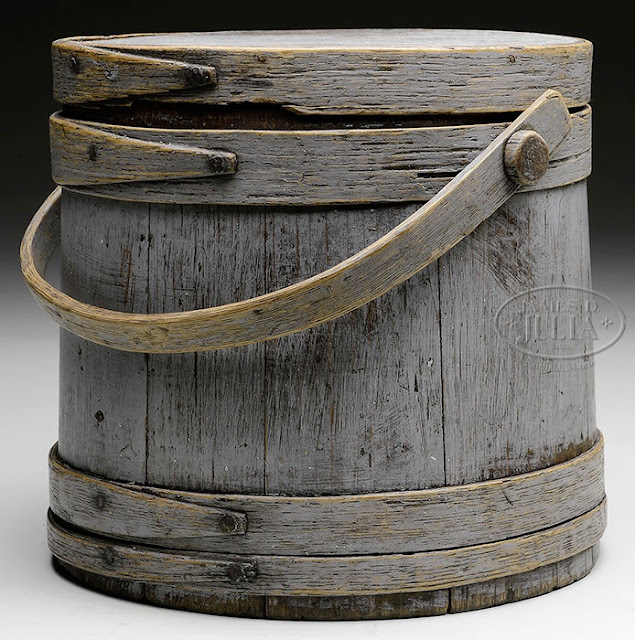 Below is a record of commercial 18th century food & drink containers. This information is from a PDF, the link to which I have supplied. This PDF contains much more information, including containers from the 19th century, & images of original containers. Olive oil sold in flasks and jars is an example of this product/package link. mustard in quarter-pound bottles, pickles in quart bottles, olive oil by the jar or chest. Hogs Lard in small kegs from 20 to 28 lbs. each (QG 26 May 1785:Richard Dalton). Barley in 50 and 25 lb cags (New-York Mercury [NYM] 26 Jan. 1761:John Alexander and Company). Best Nantz Brandy in 8 and 4 Gallon Kegs (NYM 3 Aug. 1761 :Dirck Brinckerhoff). Choice French Brandy in Kegs of 5 and 6 Gallons, at five Shillings Halifax per Gallon (QG 20 Dec. 1770:John Lees). 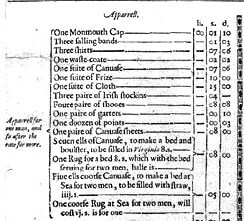 Linseed oyl in 10 gallon cags (NYM 12 Jan. 1761:Isaac Man). 7 Kegs Mustard in 1-4 lb. bottles (Montreal Herald [MH] 22 Jan. 1820:Macnider, Aird, & Whyte). Chocolate by the Box or Dozen (NYM 1 June 1761:John Morton). A few boxes fresh Durham flour mustard, (NSG&WC 30 June 1789:s. Hart). lb. bottles A very fresh, excellent Kind of Poland Starch and Hair Powder in Boxes of Cwt. each in Pound papers (NSG&WC 24 May 1785:David Fergusson). fine Genoa Vermacelli, at 1s. a Pound, or 14s. a Box, containing seventeen Pounds (DA 14 Dec. 1739:Joseph Carbon). 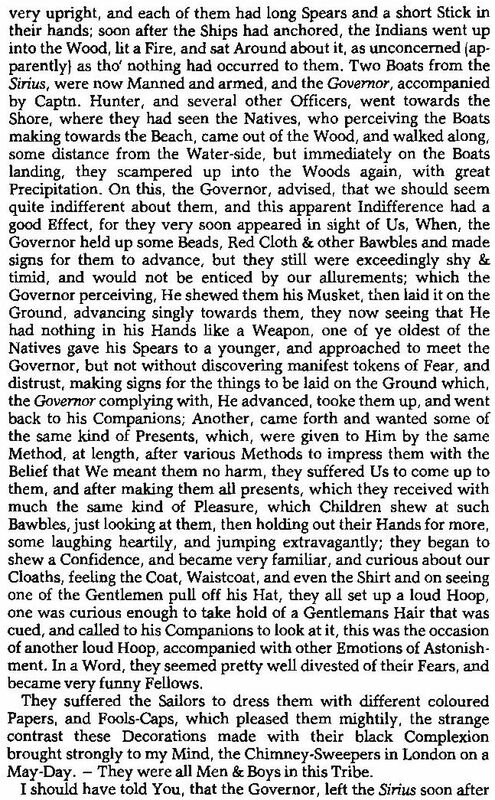 Lemmons by the Box, Hundred or Dozen (Boston Gazette & Country Journal [BG&CJ] 14 March 1774:Joseph Hall). bohea tea by the box, dozen or single pound (NYM 23 June 1755:Matheus Sleght). Bags held dry products such as bottle corks, biscuit, flour, coffee, and sometimes ginger, pepper, snuff, and cocoa nuts. Cheshire Cheese by the Basket or Single Cheese (NSG&WC 14 June 1785:Edward Oxnard). Gloucester Cheese by the Basket or smaller quantity (NSG&WC 23 Feb. 1779:Andrew Thomson). bohea and congo teas, pound, half and quarter pound tin cannisters (NYM 4 Oct. 1762:Richard Curson). He has likewise a parcel of fine green tea, in pound canisters, at 14s. a canister (NYM 29 Dec. 1766:Edward Agar). Naples soap, at 5s a pot, Containing eight ounces (DA 31 Jan. 1740:Joseph Carbn). A Fine parcel of New Honey, of this year’s collecting in glazed Pots, leather’d on the Top, and in Pots from 15 lb. to 35 lb. 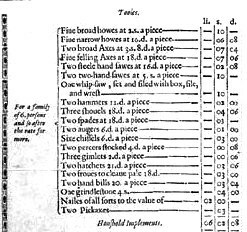 and to be sold as follows: Single Pots at Fourpence Halfpenny per Pound, and at Forty Shillings per Hundred; and some Allowance to those who take a larger Quantity (DA 17 Sept. 1762:To be Sold at the Windmill . . . ). 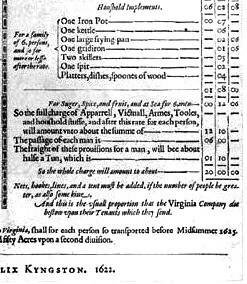 Potted Venison in small Pots at Six-pence per Pot (DA 29 July 1760:To be Sold, Fine true Grass fed Venison . . . ). Lately landed a curious Parcel of Bloom Sun Raisins, much finer than any in the Jars, in small Boxes about 12 Ib. each, to be sold by the Importer . . . at 7s. a Pound. No less Quantity than a Box (DA 4 Jan. 1762: Lately landed. Twenty Jars of very fine Lucca Oil, each Jar containing about thirty Gallons, one Jar in each lot (DA 21 NOV. 1739:To be soid by Auction. Fine Lucca Sallad Oil, neat as imported, in whole Jars, Half-jars, and Quarter-Jars (DA 23 May 1740:To be Sold . . . ). Potassium Nitrate (Saltpeter) found in Australian caves. Lucas Cave, Jenolan Caves, the Blue Mountains, New South Wales. Making gunpowder is easy, but how do you obtain gunpowder ingredients in the wilderness? 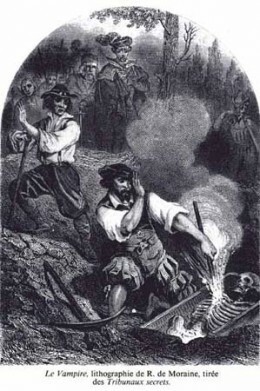 Did 18th century Woodsmen make their own gunpowder? Gunpowder can apparently be made from Potassium Nitrate & charcoal without the use of sulphur, but this gunpowder is much faster without the use of sulphur, so the amount used must be altered. Saltpeter has been obtained from caves for centuries, more notably in America, England & Europe, but also it has been found here in Australia. 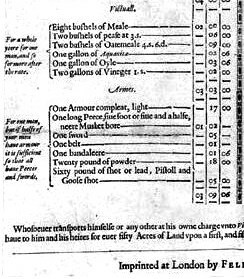 A powder without sulfur: ............100 parts saltpeter + 24 parts coal (makes poor priming powder for flintlocks). 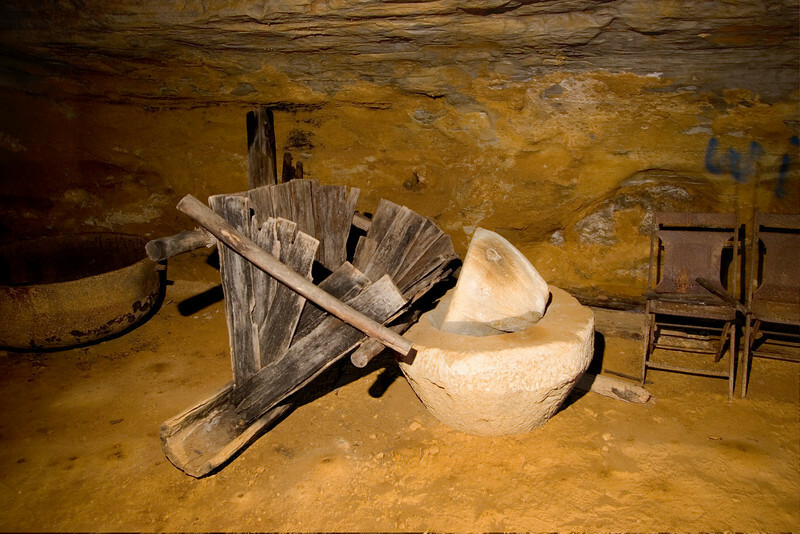 A hopper for producing saltpeter in Saltpeter Cave Kentucky. A rough hopper from Foxfire Book Volume 5. Modern analysis has also revealed another unusual feature in the Grand Archway and Devils Coach House. Sylvite (potassium chloride) and niter (potassium nitrate) are fragile water-soluble minerals which have formed from the interaction between geological and biological processes - that is, they have formed from the alteration of guano (dung) from the wombats and wallabies which frequented these large open caverns. The occurrence of potassium nitrate near Goyder's Pass, McDonnell Ranges, Central Australia. Caves: Processes, Development and Management Australia. Saltpeter Caves. "The ladies of Selma are respectfully requested to preserve all their chamber lye collected about their premises for the purpose of making Nitre. Wagons with barrels will be sent around to gather up the lotion"
"The Do-It Yourself Gunpowder Cookbook"
living room ceiling, manure, and maple syrup?”. 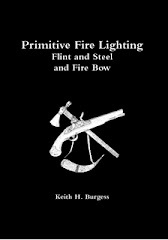 in doing so accumulated backwoods intelligence for the location of salines, lead deposits, and caves for niter mining to produce gunpowder. 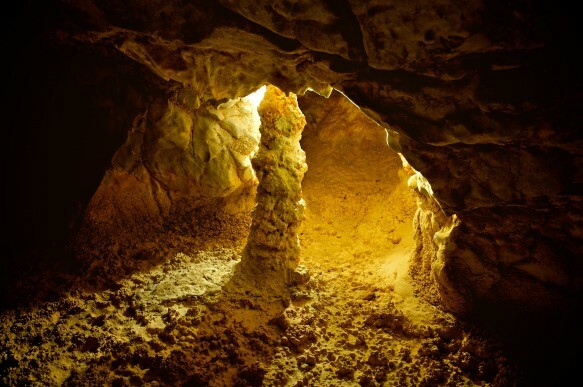 "Caves were mined by individuals and also commercially for national defense purposes during the Revolutionary War, the War of 1812, and the Civil War. Many homesteaders in the Virginias, Kentucky, and Tennessee had their own individual saltpeter caves and from them would make their own gunpowder in home-constructed V-vats or 'hoppers." A Better Life By John Buxton. 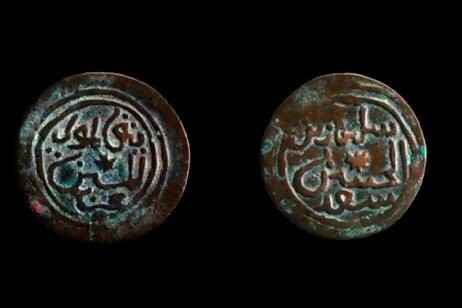 Were the African coins found in Australia from a wrecked Arab dhow? Australia. 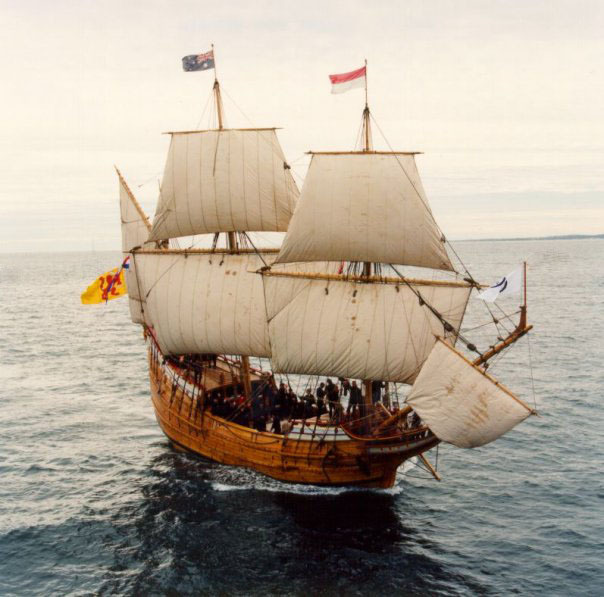 The Legend of the Stradbroke Island Galleon. 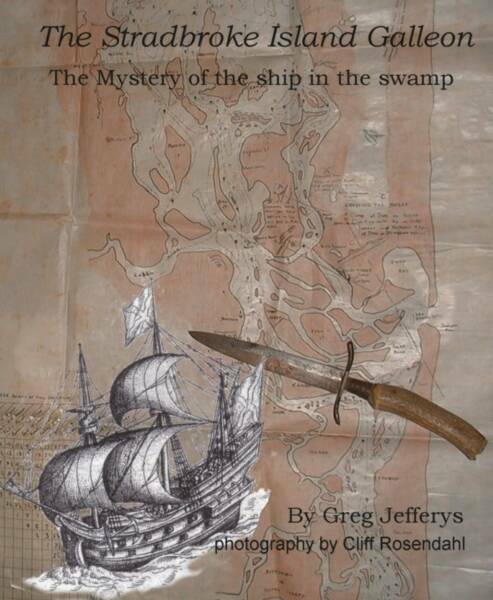 Sailor's dirk was found in the hull of the Stradbroke Island Galleon. 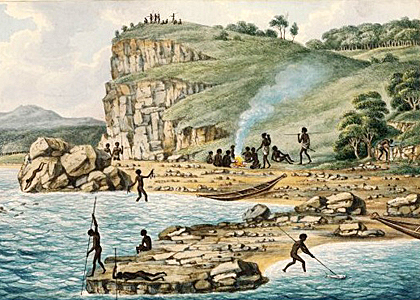 The trepang trade is Australia's first documented export industry, occurring before European settlement. 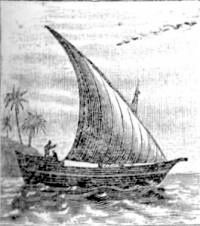 Macassans would sell the trepang harvested on the beaches of north Australia to the Chinese in Singapore. For the Chinese, trepang was a rare delicacy with aphrodisiac properties. The Macassan presence is still visible in the Northern Territory today, in the tamarind trees the trepangers introduced, as well as in the language and traditions of the Arnhem Land people. Aboriginal rangers from the Marthakal Homelands Resource Centre at Elcho Island shared this valuable knowledge with the scientists during their recent expedition, pointing out still-existing stones where the Macassans laid their pots while boiling the sea cucumber. 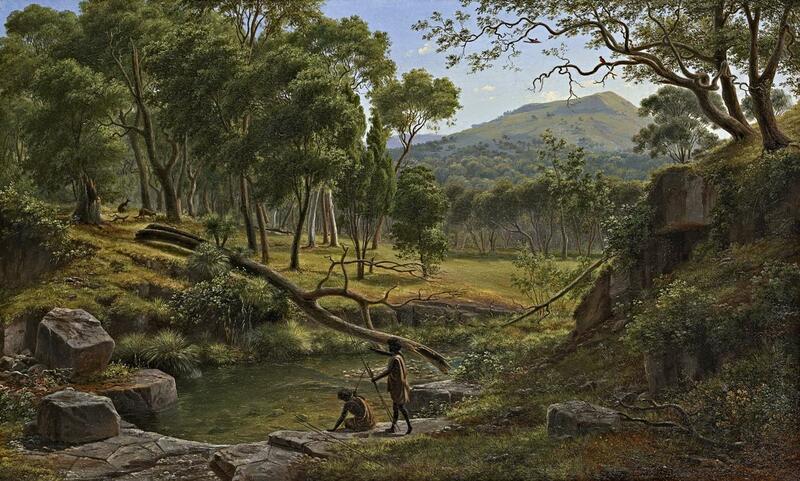 Colonial voices : letters, diaries, journalism and other accounts of nineteenth-century Australia. 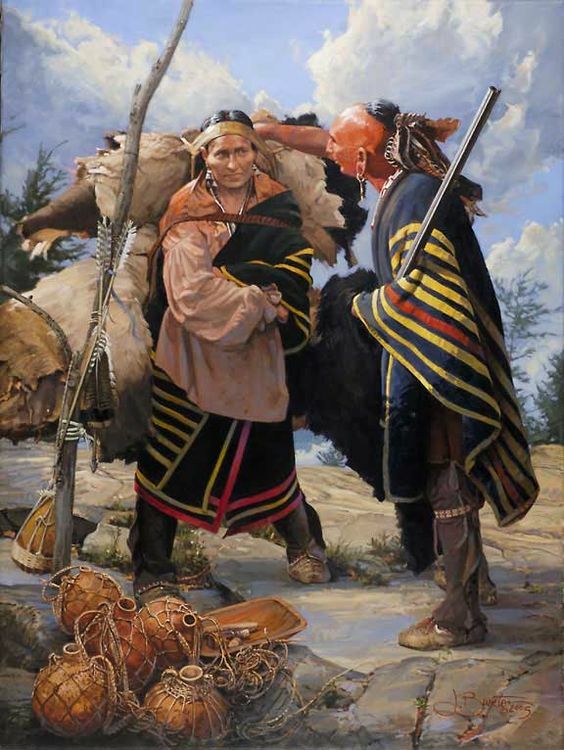 "The Indians went up into the wood,"
There is a genetic disease that causes the victim to seek the dark, & their skin will burn if they go out in daylight. 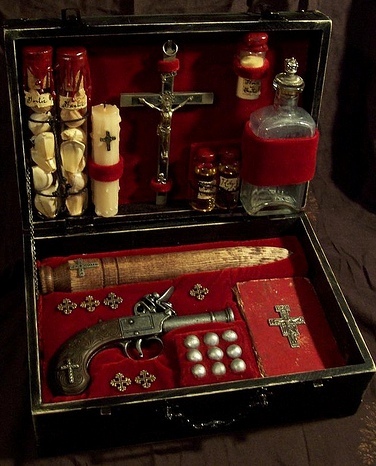 Also there is a disease that can be transmitted by bats, so it is easy to see how the Vampire stories began. Quill Knife (Pen Knife), Folding Knife & Ink Erasers. I still need to do more research on this subject to be sure of my facts, but to date this is what I have found. Early 18th century quill or pen knives were of the fixed blade type. 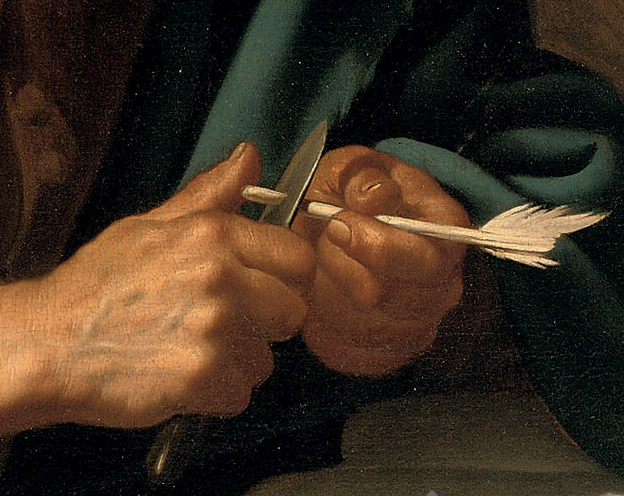 Later in the 18th century folding quill knives start to appear & become more common in the 19th century. Folding quill knives tend to have small or short narrow blades where as the common clasp knives tend to have longer wider blades. 1725 silver handles fixed blade quill knife. Early 18th century fixed blade quill knife. A John Wilson quill knife 1870, fixed blade. Rodgers scraper: ink eraser 1870. My copy of an early to mid 18th century clasp knife. Friction blade. Post mid 18th century clasp knife. Mid 18th century Gully knife. An Update of small shot for Smoothbores. More on Small Shot for Smoothbores.